Heute möchte ich euch gerne dieses kleine Fotoalbum zum Aufstellen zeigen, dass ich für meinen Mann gemacht habe. Er mußte für eine Woche auf eine Firmenschulung (das ist für uns schon eine lange Zeit). Damit er uns immer bei sich hat, habe ich ihm dieses kleine Geschenk gemacht, zum aufs Nachtkästchen stellen. Die Grundlage sind Bierdeckel (aus dem Bastelgeschäft), die ich dann mit Designpapier beklebt habe. Auf das Cover habe ich das süße Hänglar Mädchen mit 3D Blöcken geklebt. Danke fürs Schaun und hoffentlich findet ihr auch Zeit zum Stempeln!! 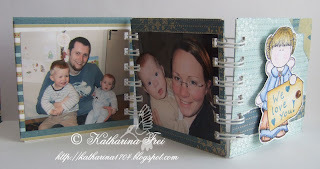 Today I want to show you this little Photobook I made with my Bind It All for my Husband. He had to go on a business travel for one week (which is quite long to be separated for us) and I made this little present for him to put on his bedside table. I used beer mats (uncoloured) and covered them with design paper. For the cover I coloured this adorable Hänglar and Stänglar girl with my Supracolour pencils and put her on foam blocks. 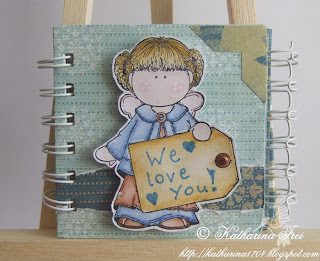 Paper: Stampin' Up design paper "Western Sky"
love the stamps and the idea. great as a gift for family! katharina, why can I not hit back anymore on the browser to go back to the site i was before? i have to close the window for your blogand open a new window again to go to the next blog. did you enable this funktion? Hu? Strange... I don't have this problem. Do you only have it on my blog? Anybody else got this problem? It's a very good idea and your mini album is really cute ! Eine tolle Idee als kleines Mitgabegschenk für deinen Mann. Da wird die Zeit vielleicht ein wenig kürzer für ihn. ach ist das wieder so süss geworden!!! It is lovely, am sure he will treasure it!! Thanks also for the heads up about the new High Hopes stamps.. they are looking fab and can't wait to see your creations with them! That is gorgeous Katharina !!! I love how you used the bind it all to make a stand up frame that is cool. oh das ist ja schön geworden...und was für eine liebe idee!! such a fabulous gift for your husband, I love it, my DH was away all week too, it is a long time! What a Gorgeous project! !..I love the colors and layouts in this book..Your husband is very lucky to get a book like this.You have a beautiful family!! what a wonderful idea for your husband, and the Hanglar little girl is adorable!